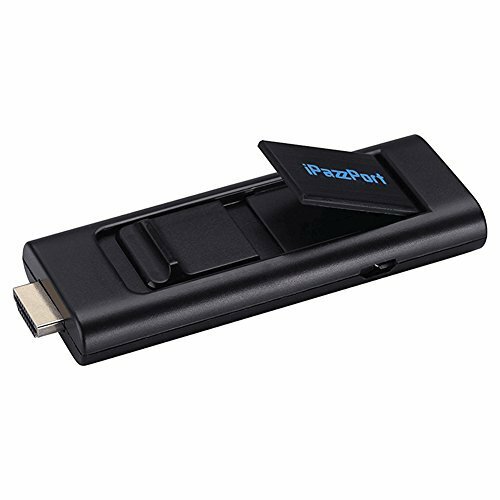 iPazzPortcast dongle support airplay and miracast, can cast your pictures, videos and ppt file from your iPhone, android smartphone / tablet to a hd tv, monitor or projector. It's convenient to share high-resolution media files with friends and family. iPazzPortcast is perfect for office and school presentations (PowerPoint, excel, word, pdf and images from the smartphone, tablet to hd tv or beamer), don't need big pc, just put the file into your smartphone or tablet. Main features: 1. Supports 2 different transmission paths (miracast, airplay), airplay for iPhone 4 and iPad 2 above, miracast for android 4. 2 above. 2. Mirror smartphone/tablet screen (photo, video, music, word, excel, PowerPoint, pdf, internet) to a large screen(up to 1080p). 3. Reinforced signal cable and external Wi-Fi antenna to avoid delays or buffering. 4. Easy setup: Simply plug the stick into hd tv and connect it to your devices. No additional app or drivers. Specification: 1. Cpu: Arm cortex a9 rk2928, ram: 2gb 2. Wifi: 802/. 11 b/g 3. Hdmi: 1. 4 4. Operating system: Linux 5. Supports transmission paths: Miracast, airplay 6. Size: 75*33*9. 3mm 7. Minimize, lightweight, convenient for home, office and traveling 8. Fn switch: Long press 5 seconds to restore the factory settings long press 10 seconds to fix the program packing included: 1x wireless miracast dongle 1x micro usb cable -1x hdm cable 1 x manual in English. Wireless Display for Miracast and Airplay, cast video/ image/ PPT from android smart devices(phone and tablet) and iphone/ ipad to HD TV/ monitor and Projector, convenient for home entertainment and business. Easy to use, no app or drivers needs, three steps to enjoy your content on large screen. Plug-Connect-Mirroring by using Miracast or Airplay mode.Search "iPazzPort Cast" on youtube to get video tutorials. It's perfect for presentation in the office or at school,cast Powerpoint, Excel, Word, PDF and pictures from the smartphone, tablet to the HD TV or beamer, Projector,it's convenient to take away and put into package.